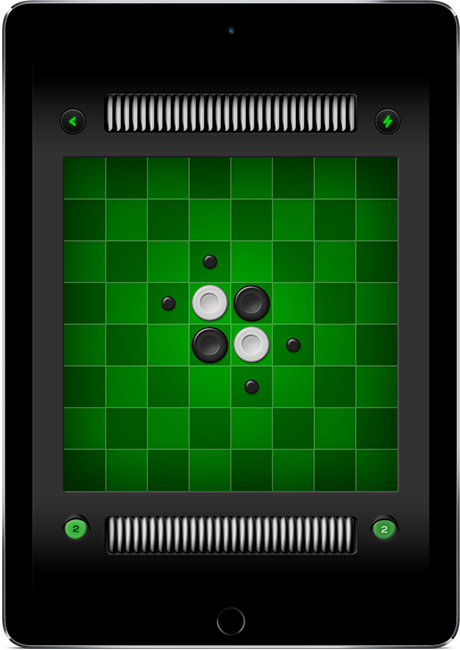 Play the game online in your browser or download the iOS app with multiplayer mode. Read how to play Revello and learn advanced strategies below. 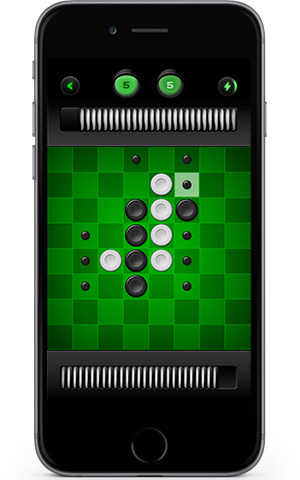 If you like to play Reversi, chess or mill, then you will enjoy this board game with its next generation interface design and a lot of great features! Revello is played on an 8×8 board similar to that of chess. 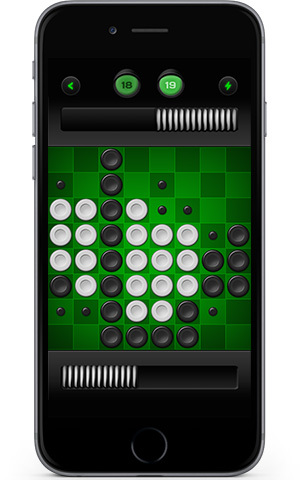 The two players each have 32 pieces, which are white on one side and black on the other. The game begins with each player having two pieces placed diagonally in the center of the board. Black begins by placing a piece, black-side up, adjacent to a white piece and opposite another black piece, so that a line of one or more white pieces directly intervenes (horizontally, vertically or diagonally) between the two black pieces. You can open with any legal move. When black places a piece so that an adjacent white piece is between two blacks, the white piece is surrendered, or flipped over to black. Note that pieces may be flipped and change hands many times during a game. You may capture one or more pieces on a given turn. 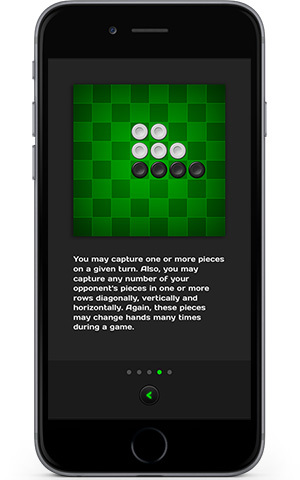 Also, you may capture any number of your opponent’s pieces in one or more rows diagonally, vertically and horizontally. Again, these pieces may change hands many times during a game. Black can capture two separate rows of white pieces in one move. If you cannot make a legal move, you automatically surrender your turn to your opponent. The winner is the player with the most pieces of his or her color on the board at the end of the game. Corners = Stability: All board squares are not created equally. Corners are the most valuable squares to take control of. Once you control a corner, it’s impossible for your opponent to reclaim that square. Building a fort of stability starts with claiming corners. Keeping in mind that corners are stable and the most valuable of all squares, you need to be careful not to grant a free corner to your opponent. Being the first to claim any of the surrounding squares around an open corner is very risky, since it grants your opponent access to the corner. Sometimes a good defense wins the match. If you have have captured a corner, build an impenetrable wall. An edge square adjacent to one of your corners can no longer be taken. If you extend that edge wall, none of those can be taken either. Build as many walls as long as possible. Keep an eye out for other possible stable squares, and your opponent’s options will be limited. Mid to late game, when discs are being overtaken left and right, it’s important to envision the repercussions of each possible move. One move option may amass you a large amount of discs at the cost of granting your opponent a corner or stable square. Another move may not turn many discs, but may be the best move if it keeps your opponent paralyzed. This is one reason why keeping mobility high is crucial for victory. A disc is considered a frontier disc if it has at least one adjacent empty square without a disc. On the contrary, if a disc is fully surrounded by other discs, it is considered an interior disc. The more frontier discs you have, the more move options your opponent has. To win the battle of mobility (number of move options), you need to keep your frontier discs to a minimum. When you are unsure of what moves to make early on, make the move that keeps your frontier disc count lowest. Your success to win depends completely on your skills, tactics and strategy. The intuitive interface makes the game easy to pickup but it takes time honing your decision-making in order to master it. Always remember though: rules are made to be broken! Don’t draw the line: Avoid building walls from one edge to the opposite edge running across the middle of the board. If all the pieces in play are on one side of the board, a skilled opponent will continue to play on that same side. This will limit your mobility and move choices since you will have no move options on the empty side of the wall. You have essentially blocked yourself out of moves on a substantial portion of the board. It’s usually best to stay quiet. If you are too loud (making moves that flips many discs), you are probably granting your opponent too many options. The quieter you are, the greater the chance your opponent makes an unfavorable move. A true Revello player knows to stays stealthy and makes his or her strikes count. Beginners tend to make moves to amass as many discs as possible early in the game. This is usually a bad idea when you are competing against an experienced player. The more discs you have mid to late game, the less your opponent has. When your opponent has few discs on the board, your move choices are minimal (leading to low quality moves). Having more move choices is called having high mobility. Late game mobility is one of the keys to winning, so think long term and try to keep your disc count low early on. But be careful not to get wiped out early, which will grant your opponent an early victory! Revello brings you the game in a clean and attractive way with a fast and enjoyable user experience. Revello is designed for iPhone/iPod and iPad with HD for all retina displays. 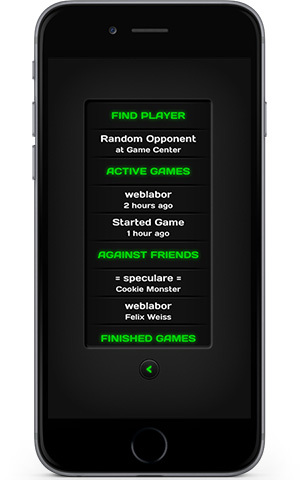 Searching for random opponents online works in background and you can play as many games as you want to the same time! You also can challenge your Game Center friends directly. Discover the best of turn-based playing and continue the game with your turn any time. Your success to win depends on your skills, tactics and strategy. Highlight the best move against the computer to learn how the champion would play. Develop your strategies to defeat them all! The intuitive interface makes the game easy to pickup. You have five computer opponents and the Champions Mode is very powerful, but it’s responding fast without making long calculations for the next move! Check out the web edition of Revello and and experience the sophisticated AI for yourself. The iOS app has some additional features. This board game is easy to learn but hard to master. All game rules are explained with samples and images on five screen pages. 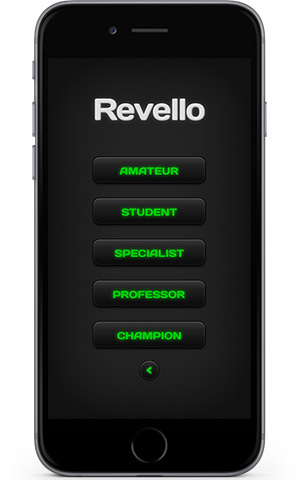 It’s easy to understand and will enable every beginner to play Revello right away!